Member of the EFEO since 2000. Dominic Goodall studied Greek and Latin, then Sanskrit at Pembroke College, Oxford. After finishing his BA (Sanskrit with Pali, 1990), he came to Hamburg for two years to learn medieval Tamil with Professor S.A. Srinivasan. He then returned to Oxford, to Wolfson College, where, under the guidance of Professor Alexis Sanderson, he produced a critical edition of the opening chapters of Bhaṭṭa Rāmakaṇṭha’s tenth-century commentary on the Kiraṇatantra, which he submitted as a doctoral thesis in 1995 and subsequently published from Pondicherry in 1998. He was attached to the French Institute of Pondicherry as a junior researcher in 1996–1997 before returning to Oxford as Wolfson College Junior Research Fellow of Indology from 1998 to 2000. In 2000, he became a member of the École française d’Extrême-Orient (EFEO, “French School of Asian Studies”). He became Head of the Pondicherry Centre of the EFEO in 2002, where he remained until April 2011. 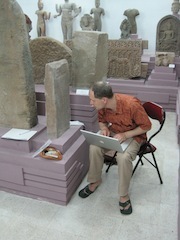 Posted in Paris from 2011 to 2015, he gave lectures at the École pratique des hautes études (Religious Sciences Section), principally on Cambodian inscriptions in Sanskrit and on the history of Śaivism from unpublished sources. He is now once again posted in Pondicherry, where he continues to pursue his scholarly interests, in particular in Sanskrit poetry and in the history of the Śaiva Siddhānta. Among his publications are editions and translations of works of poetry in Sanskrit and of hitherto unpublished Śaiva scriptures and theological commentaries. He is currently a professor (directeur d’études) at the EFEO, co-editor with Dr. Marion Rastelli of the Viennese dictionary of tantric terminology, the Tāntrikābhidhānakośa, and a contributor to the Hamburg Encyclopaedia of Manuscript Cultures in Asia and Africa (EMCAA). In May 2016, he was elected membre correspondent étranger de l'Académie des Inscriptions et Belles-Lettres.